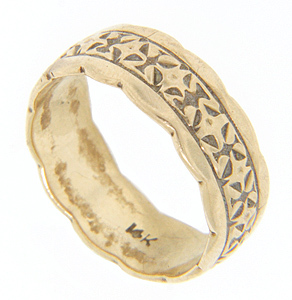 Scalloped edges give this lovely 14K yellow gold vintage wedding band a graceful look. A floral motif in moderate relief is worked all the way around the circumference of the ring. Circa: 1950. Size: 6 1/4. Cannot be resized.